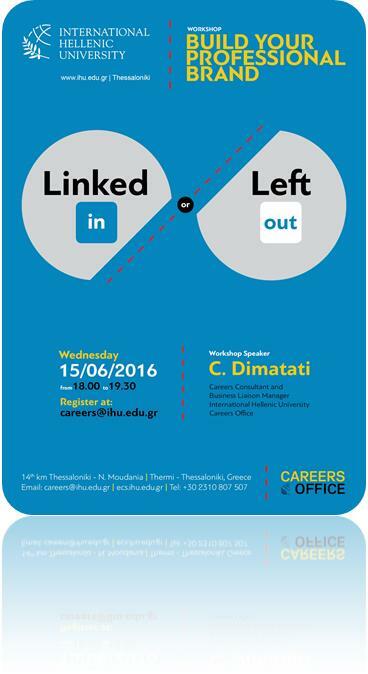 LinkedIn workshop: LinkedIn or Left Out? What we have noticed is that many people have made a profile and connected with some people and then stopped using it. You’ve established your LinkedIn account, now what? Learn how to create an effective profile and the basics of using LinkedIn. Please bring your laptop and create a LinkedIn account prior to attending. LinkedIn is the world’s largest online professional network with more than 300 million users. It connects you to people you know and lets you view their connections, greatly increasing potential networking contacts, job leads and internships. 93% of recruiters use LinkedIn for hiring purposes. There are more than 39 million students and recent college graduates on LinkedIn. They are LinkedIn’s fastest-growing demographic. It helps you stay connected to those you know and those you meet. It helps to enhance your online professional presence. How do I build a network on LinkedIn (fast)? Your e-mail must include DATE & contact details (name, last name, MSc/Ma & School telephone number, e-mail,). Christina Pravi, Manager/ Occupational Psychol​ogist, Human Capital Consulting, ICAP Advisory - Christina Pravi is Manager at ICAP Human Capital Consulting, since 2011. She is responsible for Talent Management services such as the design and coordination of Assessment/ Development Centres, psychometric assessments (Hogan & cut-e), 360ο feedbacks and Consulting projects, such as performance appraisal systems and outplacement/ career transition projects. She has sixteen years of experience in Talent Management, regarding issues in Recruitment and People Development. She has also participated in many outplacement projects, for people with admin, sales, marketing and engineering profiles for a variety of industries. As a Managing Consultant at SHL Greece, she has coordinated and has been involved in various projects regarding Personnel Selection and Development, 360o feedback, Training, and Psychometrics (adapting, standardising and developing new psychometric tools of all kind). She has worked with many multinational companies from various industries. Overall, she has assessed more than 2.500 people and provided feedback to approximately 800 participants. She holds a BSc in Psychology from University of Crete, a MSc in Occupational and Organisational Psychology from University of Surrey and a Professional Post-graduate Diploma in Human Resources Management from EEDE. She is also accredited as a Test User – Ability and Personality (BPS certified). She is currently attending a Coaching diploma. 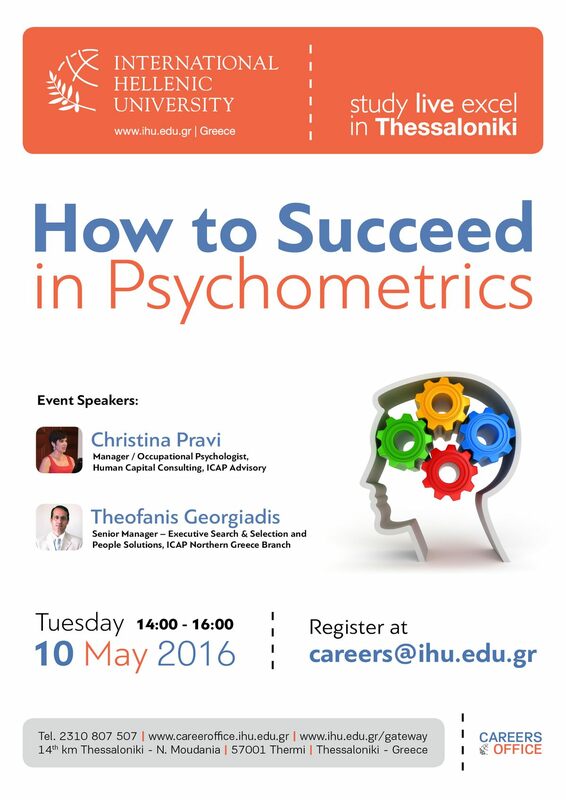 She has been a member of BPS (Chartered Psychologist) and of Pan-Hellenic Psychological Association. She is a licensed psychologist. Theofanis Georgiadis, Senior Manager – Executive Search & Selection and People Solutions, ICAP Northern Greece Branch - Theofanis Georgiadis holds the role of the Senior Manager and he is in charge of the People Solutions Services in ICAP Group´s Northern Greece Branch. He has been working for ΙCAP since 1993 and has significant experience in Executive Search and Selection, Outplacement, Outsourcing services, Training, Assessment testing, Remuneration Surveys, participating also in several Internal (re)organisation Assignments. His role is to advise client companies; having an excellent knowledge of Northern Greece’s market he has led recruitment projects in several vertical markets with focus on the FMCG and in the manufacturing sector, placing successfully employees and executives in numerous companies across his region. He graduated from the Economic Department of Aristotle’s University of Thessaloniki and holds an MBA from the University of Stirling in the UK, being also a certified assessor of Hogan Assessments. Love them or loathe them, psychometric tests are used by many companies and organizations as a means to work out the suitability of potential employees or other participants. If you haven't already undertaken a psychometric test, the chances are high that you will at some point, and knowing how to succeed in psychometric testing is your ticket to moving ahead in your chosen career. Psychometric t​ests aren't about luck; prior preparation will improve your scores and make it easier to focus on what is being sought after in the testing process. Psychometric tests focus on certain aspects of your knowledge, such as verbal and numerical reasoning, personality traits, and other abilities assessment, such as stamina. To succeed in them, you'll need to do some preparation in advance but there are numerous opportunities for you to practice, so treat this as a positive challenge rather than a potential hurdle in your job hunting. This workshop does exactly that: it aims to provide you with valuable hints and tips on how to succeed, as well as practical examples taken from real-life aptitude tests and psychometric questionnaires. Your e-mail must include contact details (name, last name, telephone number, e-mail, MSc & School). Please note that, once registered, participation is compulsory. Master International Business +10 years of experience in International Recruitment with a focus on the automotive, energy and healthcare market, having successfully placed more than 600 Engineering and Medical Specialists in more than 20 countries. 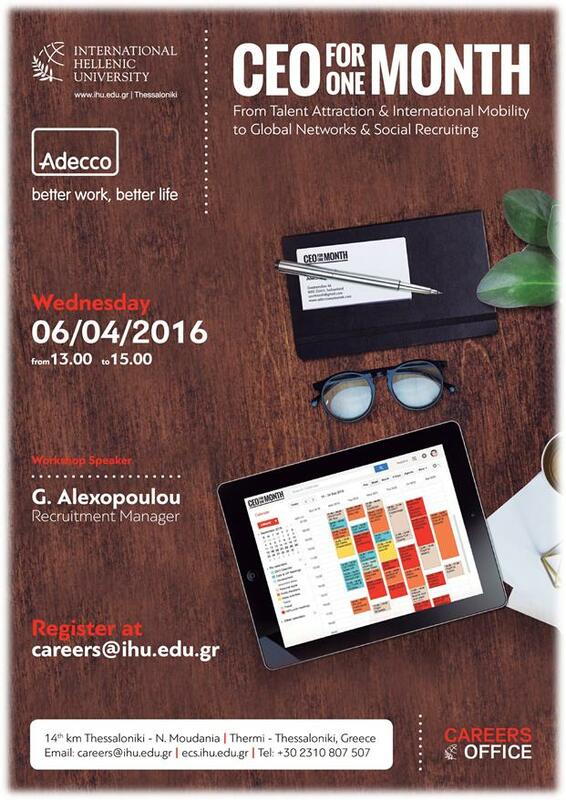 Grecruitment – Summary: Grecruitment is a Thessaloniki - based cross - border recruitment consultancy and a pioneer in recruitment when it comes to supporting Greek professionals in finding a job abroad. Launched in 2009, Grecruitment was founded to supply a flexible, effective solution to recruitment and staffing needs within the global Greek community. During that time, we have strived to listen, learn and evolve an ever - improving platform from which we deliver an even better service. To this day, we remain an independent business which has matured and grown into an even more efficient organization to cater for all levels of recruitment. You’ve established your LinkedIn account, now what? Learn how to create an effective profile and the basics of using LinkedIn. 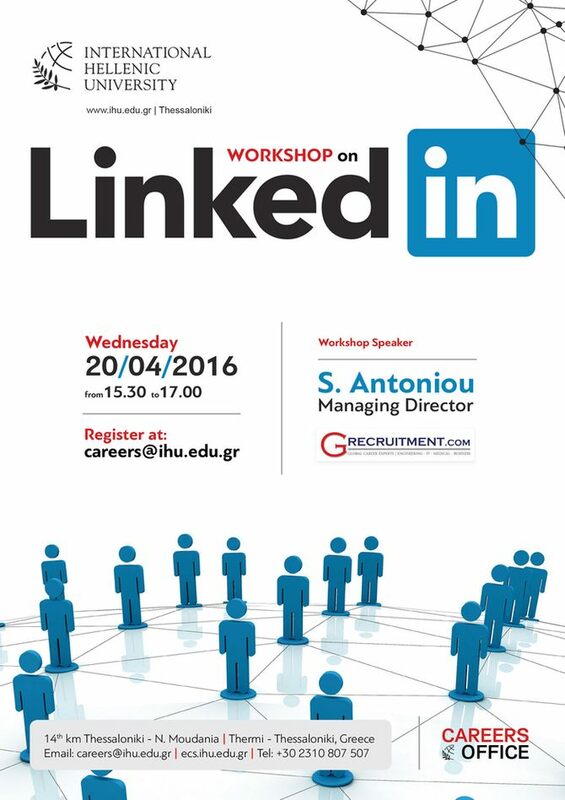 Please bring your laptop and create a LinkedIn account prior to attending. LinkedIn is the world’s largest online professional network with more than 300 million users. It connects you to people you know and lets you view their connections, greatly increasing potential networking contacts and internships and job leads. Your e-mail must include DATE & contact details (name, last name, MSc & School telephone number, e-mail,). In today’s competitive market you need the perfect “CV” to set yourself apart. Learn how to showcase your accomplishments and abilities, focus on the needs of the company and create your first targeted “personal marketing flyer”. 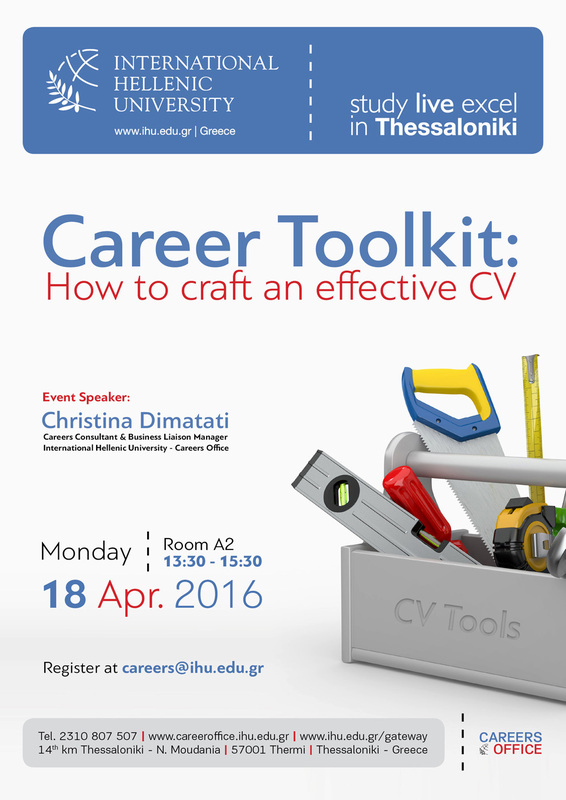 Register for this event by sending an e-mail to careers@ihu.edu.gr with the code CV. Your e-mail must include Date and contact details (name, last name, telephone number, e-mail, MSc). Ms. Alexopoulou possesses more than six years of experience in the fields of recruitment and career guidance. She joined Adecco on 2008 as a Generic Recruiter, undertaking the most challenging positions and projects in temporary and permanent recruitment. On Feb. 2012, she became certified by LHH being actively involved in the delivery of one-to-one Career Transition Programs to all levels. On July 2014, she was promoted to the position of Recruitment Manager, leading Adecco's Recruitment Team. Prior to Adecco, she worked as a Career Counsellor at The National & Kapodistrian University of Athens, where she was responsible for the development of the telecouncelling services of Career Office. She holds a Bachelor in Psychology from National and Kapodistrian University of Athens and a MSc in Career Counseling and Guidance. In this Workshop we will deal with the findings of two researches. The first one is The Global Talent Competitiveness Index (GTCI), which is an annual benchmarking study measuring the ability of countries to compete for talent. Designed as a practical tool for governments, businesses and non-profit organizations, GTCI ranks over 100 economies according to their ability to develop, attract and retain talent. The Index is developed in partnership with Adecco, the world's leading provider of HR solutions. The second one is the 2015 Adecco Work Trends Study, 2, which builds on the findings of the Adecco Global Social Recruiting Study 2014 and also looks at further aspects of the future of work, namely smart - working solutions. The scope of the study thus encompasses not only social recruiting and social job seeking but how job seekers and recruiters think about new methods of working and where they are applicable. The study was conducted in 26 countries, with more than 31,793 job seekers and 4,168 recruiters participating (please see the attached file). Moreover, it will be presented the “CEO for One Month”. Adecco Group has created the opportunity for youngsters to become the *CEO for One Month of Adecco. Youngsters from all over the world can apply for this opportunity, getting a taste of running the world’s leading provider of Human Resources, with more than 32,000 employees in over 60 countries around the world. 50 selected youngsters will have a unique learning opportunity alongside our leaders. One of them will become Global *CEO for One Month. One of them, will become Global *CEO for Month and gain first-hand experience in managing the world’s leading provider of Human Resources, with more than 32,000 employees in over 60 countries around the world. Whether you know precisely what you want for your future career, whether you are still deciding, or whether you are just starting to think about careers - this is your chance to find out more. Careers fairs provide you with the chance to meet employers face-to-face, to learn about current vacancies and opportunities available, and to market yourself to prospective employers. However, It can be difficult for students to stand out at Fairs; there are so many people there and it can seem overwhelming. Being prepared is the best way to make a good impression and get noticed. Your e-mail must include contact details (name, last name, telephone number, e-mail, MSc & School). Randstad was founded in 1960 by Dutch entrepreneurs and university students Frits Goldschmeding and Ger Daleboudt, who were both studying economics together at the time. It is a story about entrepreneurship, dedication and job satisfaction. Randstad is a leading human resources company in Greece which specializes in HR services. With over 55 years of global HR experience and more than 15 years' experience in Greece, Randstad provides clients immediate access to global and local HR expertise to drive business performance. Randstad is Greece's market leading HR services provider offering the broadest portfolio ranging from permanent recruitment and contract staffing to recruitment process outsourcing. Can you take cues from your interviewers for a better performance? Got a job interview? What does your body language say about you? 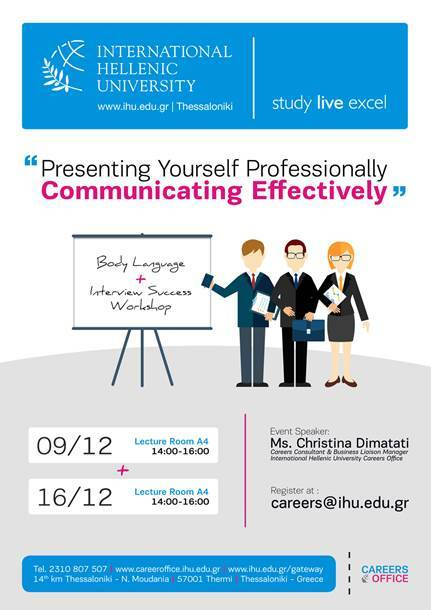 Manage your body language in a job interview, impress your employers and secure that new job. It’s not what you say but how you say it! This session looks at the preparation required before an interview and gives some insight into what happens in different types of interviews including panel, telephone and assessment centre situations and do's & don'ts. The second part of the workshop has been designed to give ample opportunity to practice interviewing – “Mock Interviews” - and problem-solving skills in a risk-free environment. Your e-mail must include DATE & contact details (name, last name, telephone number, e-mail, MSc & School). Learn how to write professional and effective cover letters, thank you letters, follow up and other job search career letters. 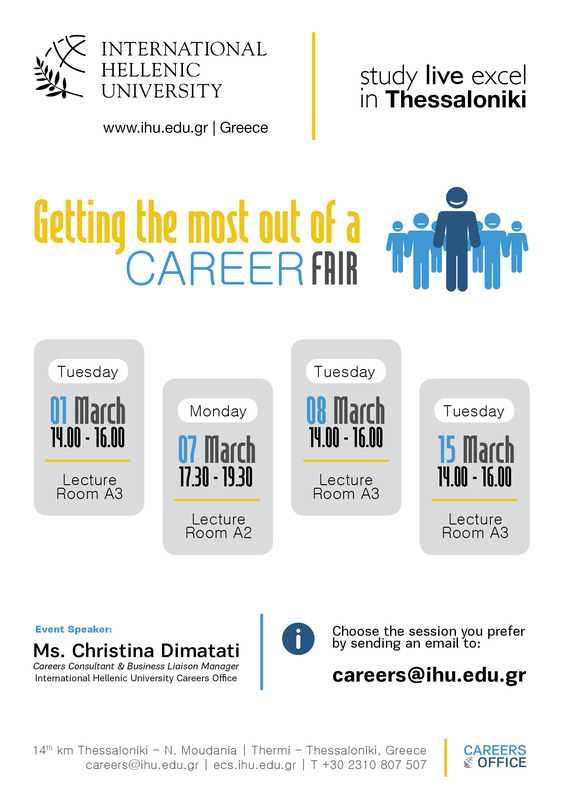 Register for this event by sending an e-mail to careers@ihu.edu.gr Your e-mail must include contact details (name, last name, telephone number, e-mail, MSc & School). Please note that, once registered, participation is compulsory. It’s not what you say but how you say it! This session looks at the preparation required before an interview and gives some insight into what happens in different types of interviews including panel, telephone and assessment centre situations. The workshop has been designed to give ample opportunity to practice interviewing and problem-solving skills in a risk-free environment. 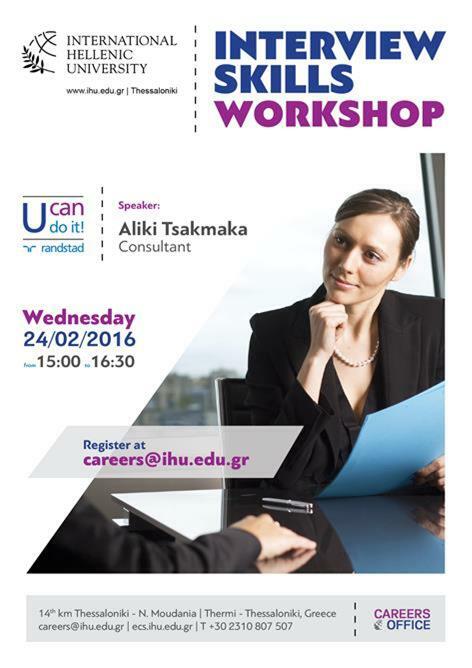 Register for this event by sending an e-mail to careers@ihu.edu.gr the latest byMonday, 7th of December, 2015. Your e-mail must include DATE & contact details (name, last name, telephone number, e-mail, MSc & School). Please note that, once registered, participation is compulsory.